Filter by Standard Steam Gift Preorder Bonus Commander Ed. General Ed. Total Conflict Ed. 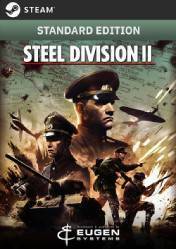 Attention: Steel Division 2 is a game in digital key or Steam key format (although it may also be available in other versions such as Steam Gift), depending on which online store you buy. Depending on the format it must be activated in one way or another. Remember also that they may have regional blocking, so pay attention to this information and check each of the stores. Steel Division 2 is a real-time strategy game that will put you in the shoes of the commander-in-chief of one of the two sides during World War II. This second delivery will place us on the Eastern Front in 1944, during Operation Bagration, the Soviet offensive against the Nazi armies in Belarus. We have more than 600 units, 25 maps and multiple game modes. One of the great advantages of this second installment is the number of game modes, which will allow us to play as we want and offers hundreds of hours of solitaire, multiplayer and cooperative play. Battles will take place on huge maps up to 150x100 km, where we must plan our movements carefully and avoid at all costs the enemy strategy. We'll use T34 tank battalions, Katyusha multiple rocket launcher-armed infantry and IL2 ground attack aircraft, all faithfully recreated down to the last detail. There are no comments yet about Steel Division 2. You can be the first one! Steel Division 2 - New Axis Divisions and Gameplay Mechanics! Steel Division 2 - New Deck Builder and Statistics! Steel Division 2 - Release Date, Trailer and More!